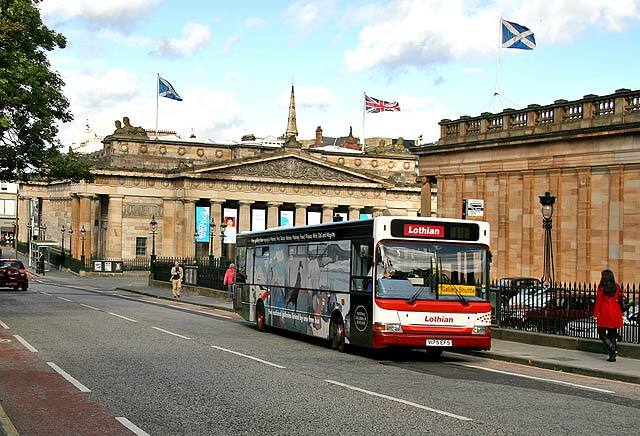 Here, the bus on the free Gallery Shuttle service waits for passengers near the foot of the Mound, outside the National Gallery of Scotland on a fine day in September 2007. - The Mound: for Royal Scottish Academy and National Gallery of Scotland. - Belford Road: for Dean Gallery and Gallery of Modern Art. - Queen Street: for Scottish National Portrait Gallery. The gallery on the left in this photo is the Royal Scottish Academy, and the gallery on the right is the right is the National Gallery of Scotland. This service was provided by the National Galleries of Scotland, but was withdrawn shortly after this photo was taken because the National Galleries could not afford to continue to pay for its operation.